This warm, delightful treatment using a red vinyl door explains the rising popularity of the building material among the many options available for new or replacement construction. 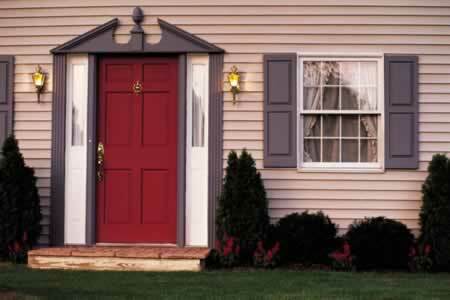 Versatile and durable, a vinyl door provides years of outstanding protection of your homeowner investment while requiring a bare minimum of upkeep. Unlike wood, which can bow, crack, or fade under changing seasons and extreme temperatures, vinyl holds its shape and cleans simply with water from your hose and a mild detergent. Another reason that today's vinyl doors are popular is that a wide range of colors and energy options suit the demands of consumers for cost-effective solutions to rising heating and cooling bills. This example proves you can find the perfect color to complement your design theme, whether you have a historical style or a contemporary home. Gray vinyl trim and window treatments are perfectly coordinated with the door and exterior siding.